Bigger screens are essential to augment 5G experience, and LG Electronics delivered it in a dual screen phone rather than unfolding to double the displays as flashed by bigger rivals Samsung Electronics and Huawei. 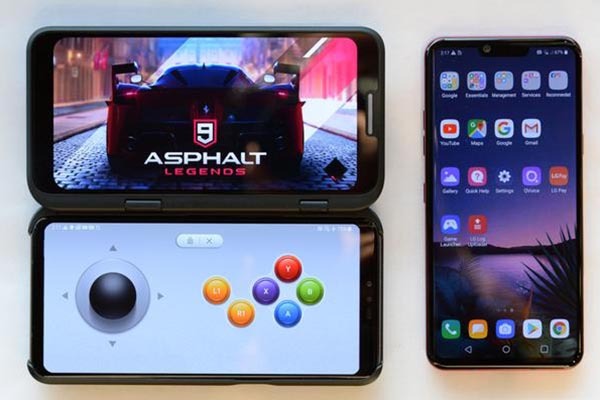 At the Mobile World Congress 2019 in Barcelona, Spain on Sunday (local time), LG Electronics unveiled the 5G-enabled V50 ThinQ with a new attachable flip-cover display. The V50 ThinQ allows users to feel as if they use two smartphones at the same time. 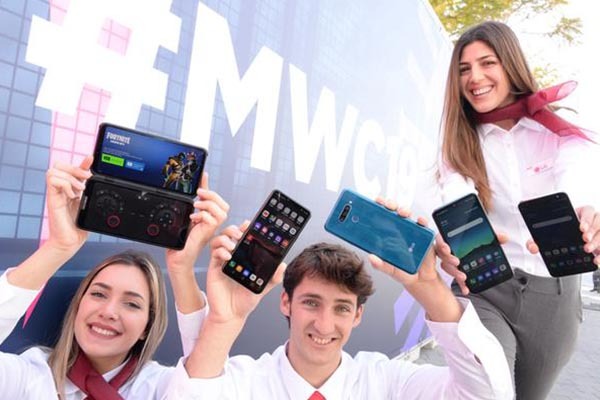 LG Electronics models are introducing a new lineup of smartphones including the LG V50 ThinQ, LG G8 ThinQ, LG Q60, LG K50 and LG K40 (from left) at the entrance of Barcelona`s Fira Gran Via during the World Mobile Congress. For game playing, for example, the dual screen is used as a game screen while the other screen as a controller. The V50 ThinQ has also a new vapor chamber to better dissipate heat that often occurs during multiple access and multitasking enabled by the 5G network. The battery capacity is up by 20 percent to 4000㎃h from the previous V40 model. Qualcomm’s newest Snapdragon 855 mobile chipset comes to the V50 ThinQ and software is optimized to meet the requirements of 5G multitasking. The V50 ThinQ has two upgraded front cameras and three on the back. One on the front has a wide-angle lens and one on the back has a telephoto lens. In particular, the out-focus function which enables for a blurry background video is adopted for both front and rear cameras for the first time in the world.